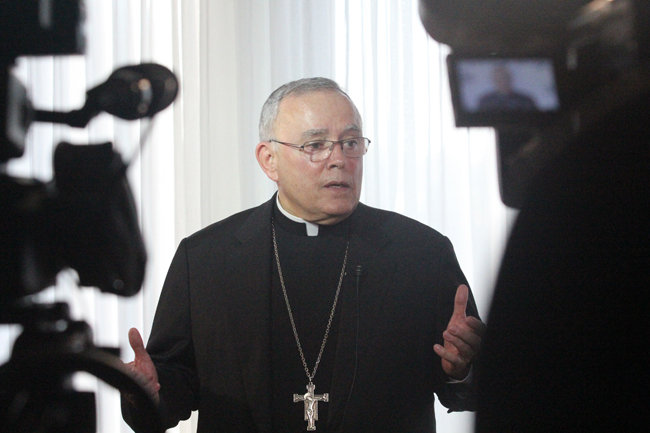 Archbishop Charles Chaput is back from Rome where he caught a glimpse of the kind of discussions that will be featured at the 2015 World Meeting of Families in Philadelphia. He also reflected during an interview this week on Pope Francis, who confirmed he’ll come to the city at the conclusion of the congress next September. 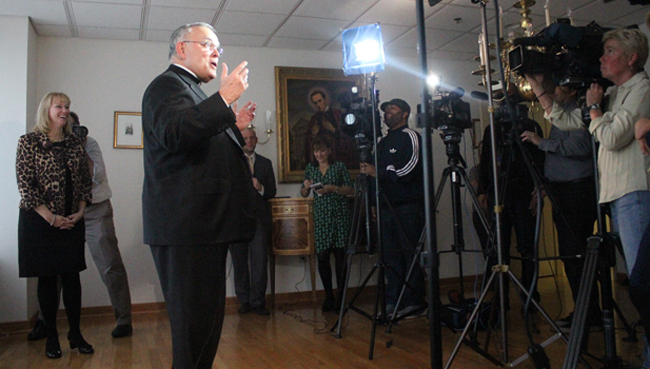 The archbishop answered questions from members of the local media for about 20 minutes Monday afternoon, Nov. 24, at the Archdiocesan Pastoral Center in Philadelphia. While most questions concerned plans for the coming papal visit, the archbishop also reflected on the “Humanum” conference last week in Rome, a three-day ecumenical meeting on the complementarity of man and woman in marriage. The ecumenical and interfaith dimension will be a prominent feature of the World Meeting of Families, the archbishop said. He noted that 24 percent of the speakers for the congress’s six keynote talks and 67 breakout sessions will be non-Catholic. Archbishop Chaput called the coming congress “a realistic gathering” that will examine ways to promote marriage, raise children and support the family. The archbishop at Monday’s press conference tied in the themes of the congress, which takes place Sept. 22-25, 2015 with the long-anticipated visit of Pope Francis, who is expected to visit Sept. 25-27. The Holy See has not yet released details of the pope’s itinerary in Philadelphia or other possible U.S. cities he might visit during his trip. An advance planning team from the Vatican is expected to visit Philadelphia in February, the archbishop said. “It will be a week of adventure,” said the archbishop, who expects more than a million people for the papal events in Philadelphia especially during the Mass Pope Francis will celebrate on the Benjamin Franklin Parkway on Sunday, Sept. 27. “It will be a great opportunity for the Holy Father to speak about marriage and its relationship in the family,” the archbishop said. When Pope Benedict XVI announced in June 2012 in Milan, Italy, that the next World Meeting of Families would be held in Philadelphia in 2015, expectation immediately arose that the pope would attend the gathering as past pontiffs had done. The families’ congress is held in a different city every three years; the Philadelphia event will be the eighth since St. Pope John Paul II began the tradition. Only installed as Archbishop of Philadelphia nine months earlier, Archbishop Chaput was just beginning to grapple with the demoralizing effect of two grand juries on sexual abuse of children by priests, the ongoing trial of Msgr. William Lynn, the closure and merger of Catholic parishes and schools, the impact of a $39 million operating budget deficit leading to scores of employee layoffs and the discovery of more than $350 million in underfunded, long-term financial obligations including retirement, insurance and other funds. But by 2013 the turnaround in finances was underway, Pope Benedict announced his retirement and Cardinal Jorge Mario Bergoglio was elected pope. Archbishop Chaput called Pope Francis “a very nice person” whom he first met in 1997 at a synod in Rome. At Vatican meetings, the archbishop explained, prelates are seated according to episcopal rank, and the two archbishops found themselves next to one another and struck up a friendship. 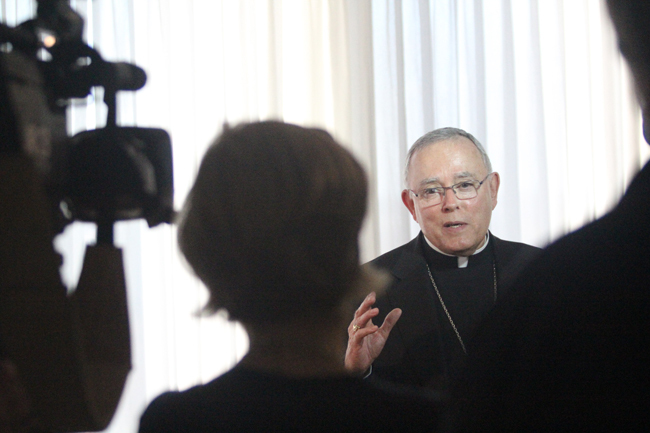 “I thought he was special,” Archbishop Chaput said of the future pope. “He spoke wisely and thoughtfully.” Although the pope’s gregarious demeanor has captured the imagination of people the world over, Archbishop Chaput emphasizes there is more than that to the pope. “He’s a very thoughtful man,” he said. Archbishop Chaput recognizes that the families’ congress, the papal visit and all the visitors those events will attract to Philadelphia have the potential to inject a much-needed morale boost to the archdiocese. 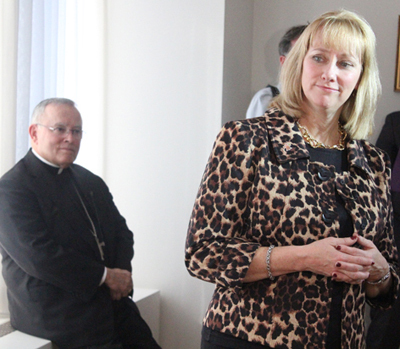 “This could be the rebirth of the archdiocese,” he said. “I am grateful for the opportunity, and I am sure glad it’s here” in Philadelphia, he said. The rejuvenation of Catholic pride and the many public displays of faith is actually one of the goals of the World Meeting of Families, according to Donna Farrell, executive director of the organization. Those goals are “to reinvigorate the archdiocese, to strengthen Catholics and to showcase the Philadelphia region,” she said at the press conference. To the final goal, most cultural institutions in the city are planning special exhibits or programs in conjunction with the World Meeting, such as the Philadelphia Museum of Art, the Franklin Institute, Kimmel Center, Please Touch Mueum and many more. “We want to engage attendees with the arts programs in the region,” Farrell said. As an example, she described a project with the Mural Arts Program that will involve congress participants building a mural on a city building during the week of the congress and completing it by the meetings’ end. The mural “will be a memorial and a testament to what happened here,” Farrell said. Both she and Archbishop Chaput declined to offer specifics of detailed plans for the papal visit following the congress because they have not been fully developed. But the enormity of the third week of September 2015 in Philadelphia is already dawning on the archbishop.